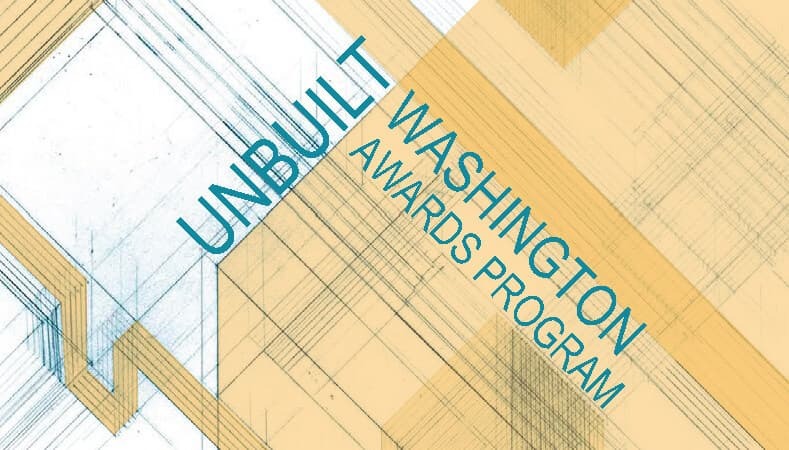 The Unbuilt Washington Awards bridge the gap between academic and professional design communities by providing a forum for recognizing the contributions of both younger and established practitioners alike. "This is a fantastic project. The scale of both drawing and the detailed thought make this a wonderful place that we all want to experience. The care that was taken to preserve the tile facades in a way that allowed them to participate in contemporary living is extremely well executed." "As a conceptual exploration and innovation, I think this particular project is stellar. It addresses issues of scale with recreation and re-imagination of what the city is like. I think for those who would use it on a daily basis year in and year out there is a quality of magic and mystery and storytelling in this. This is remarkable to achieve in a redevelopment project." "This highly innovative project succeeds on every scale and level of exploration. It addresses issues of urbanity on an intimate scale with joy and precision." "Comparison between celluloid film and glass surfaces was astounding. It helped to create a clear relationship between program, existing building and the surrounding context." "It’s a particularly interesting contextual exploration of the surrounding city that identifies things like reflections and crystallized moments and then uses them as a framework in which to develop a building strategy that focuses on sequence of movement and experience." "This project revels in using film both as a point of departure and a method for capturing space cinematically and through the storytelling visuals of its spatial organization." "The episodic quality of the final rendition of the plan has a direct correlation to the film that was done as part of the Research. For me this represents a very effective way of creating Architecture that is like what we experience - space is episodic not linear." "This is a beautiful example where scale, place, and views have meaning and is a physical manifestation of governmental intent and structure. To have a view to the beach and all the people on the beach from the parliament house and equally to have views of the mountains is extraordinary. Corridors and gathering areas are fundamentally different from historical use of scale in government buildings. Here scale is used to instill a sense of calm in the typical citizen." "The conceptual compression of space and time is particularly impressive when actualized as an internal experience, where the architecture as an object disappears and gives way to a procession of discovery and surprise." "The sensitivity to preserving the existing artifact demonstrated great restraint and elevated the relationship between the program and the history of the site." "The economy of spatial moves lends a strong impact on how spaces are inhabited and perceived. That attitude is evident from the very conception of the project through its poetic execution." "You can safely say that this project shows how coal CAN be the future. It elevates existing deteriorating infrastructure through a new purpose without making it a spectacle. The sensitivity of the structural integration of old and new allows both to exist as co-conspirators in this adaptive reuse." "There has been a lot of Innovation around the way in which students are educated but in the recent years the concerns about risk and exposure have begun to truncate the nature of student experience. Learning really is about taking risks and exploring the messy. This does it in extraordinarily elegant way and it also continues decades of work to take back the riverfront and integrate the industrial waterfront with the larger community. I would like my kid to go to school here."